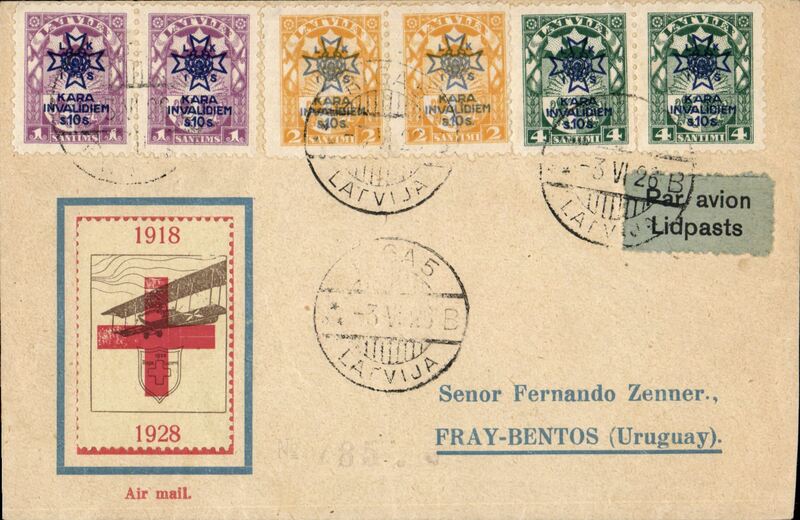 Early air cover addressed to Uruguay, franked pairs of the 1923 War Invalides Charity set canc Riga cds, violet circular "Derluft-Riga" cachet verso, light grey blue airmail etiquette rated very scarce by Mair, printed souvenir cover with green/yellow vignette with biplane and Riga/Lucerne and a cross inside a shield. Image. 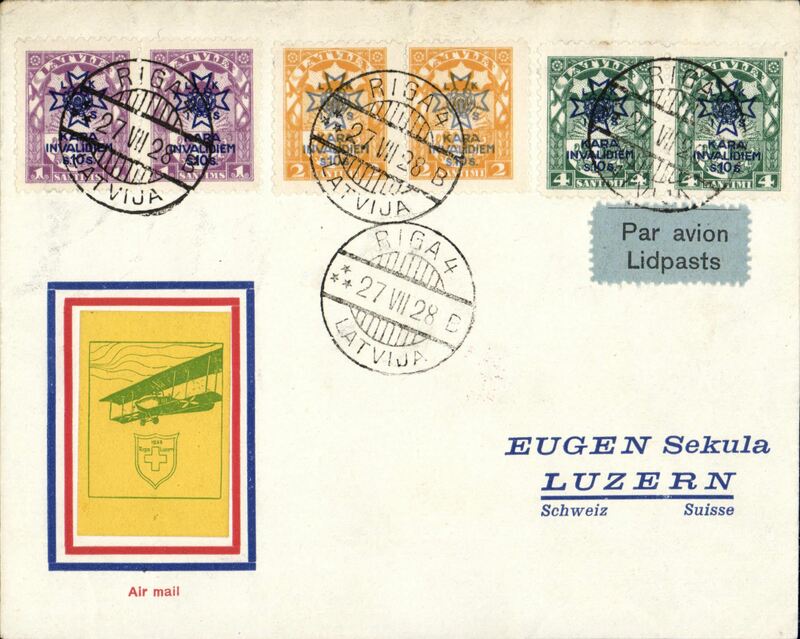 Early air cover to Lucerne, Switzerland, private 30/8 receiver verso, franked pairs of the 1923 War Invalides Charity set canc Riga cds, red circular "Derluft-Riga" cachet verso, tied black/light grey blue etiquette rated very scarce by Mair, printed souvenir cover with green/yellow vignette with biplane and Riga/Lucerne and a cross inside a shield. 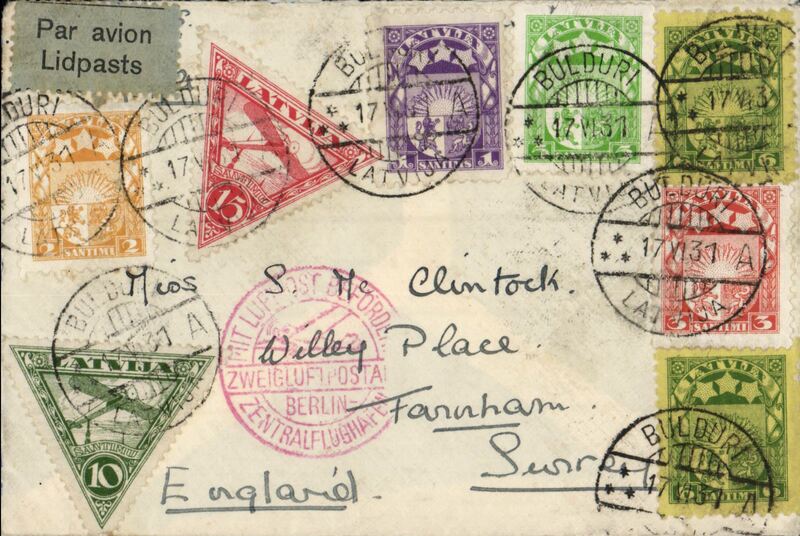 Early airmail, Latvia to England, Bolduri to Farnham, no arrival ds, via Berlin 18/6, plain cover franked 1921 air set of 2 and additional 23r, canc Bolduri/Latvia cds, nice strikes of red circular 'Mit Luftpost Befordert/Zweigluftposta/Berlin/Zentralflughafen' hs's front and verso,black/grey airmail etiquette. Unusual item with fine strikes and in good condition.